Which Inhuman From the Comics Is About to Join Agents of SHIELD? The crew at Marvel TV was rather cagey about what’s ahead for Agents of SHIELD in today’s Comic-Con panel, but we did learn one thing the upcoming season: There’s a new Inhuman joining the show, one who has already appeared in the comics. But the one piece of news we did get was from Loeb himself, who announced that the Inhuman character Lash, created by Matt Fraction, Charles Soule, and Joe Madeureira, would be joining the show. 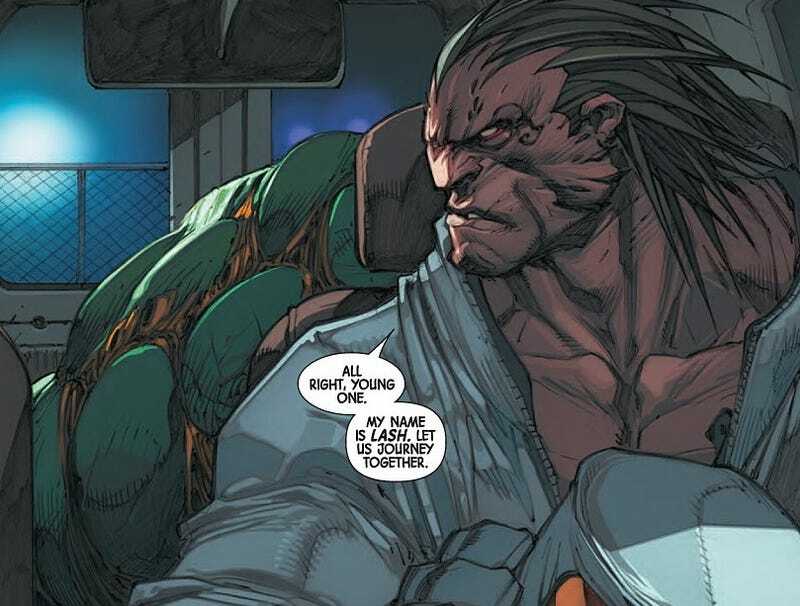 In the comics, Lash grew up among the Inhumans, and manifested energy absorption and manipulation powers after his exposure to the Terrigen Mist. He’s also got rather unnerving blank eyeballs. Loeb didn’t say what Lash’s role will be in the upcoming season, or what complications he would be throwing at our characters. The other big moments from the panel came in the form of two videos, which we hope come online soon. One was a blooper reel, which is just charming. (Clark Gregg stays in character even when he realizes he’s forgotten his lines.) The other one was the real gem, though—a “peek” inside the SHIELD writers room. What we actually saw was Jed Whedon and Maurissa Tancharoen pretending to brainstorm the season three storyline. The best moment is when Tancharoen slips up and refers to the character now known as Daisy Johnson as “Skye” and has to put a dollar in the SHIELD version of the swear jar, the “She’s Daisy now” jar. They also “reveal” Daisy’s codename; it’s Quake, just like in the comics, but they toss out “Aftershocker” and “Seizmo” before settling on Quake. And Quake’s team name is officially Secret Warriors. Throughout the video, we see Whedon playing darts, and eventually we pull back and see that the dart board is plastered with the cast members’ faces. Next to it is a whiteboard that reads “Who should we kill in season 3?” Each character has a series of tick marks based on how many times Whedon hits them on the dart board. Next to Simmons, it says, “Already very dead.” Elizabeth Henstridge was mock horrified about that on stage later on. Then the late Agent Triplett himself, B.J. Britt, shows up in the video and takes his turn at the dart board. “Let’s she how you like it,” he tells the faces of the still-living characters. Later, while chilling on the couch, he suggests to the writers that they shouldn’t be talking about who to kill; they should be discussing who to bring back. A joke or a bit of jovial foreshadowing? We’ll have to see when Agents of SHIELD comes back on September 29, 2015.